San Diego Gas & Electric said Friday it is prepared with sufficient power supplies despite what is shaping up to be a warmer than normal summer. “We’re fully prepared for a warmer than normal summer with enough electricity supplies,” said Caroline Winn, the utility’s chief operating officer, at a briefing for media. “One of the reasons that we are so prepared is the infrastructure improvements we’ve made since last summer,” she told reporters at the utility’s emergency operations center in Kearny Mesa. Still, she cautioned that an extended heat wave coupled with problems elsewhere in Southern California could require San Diegans to conserve energy. “Weather really drives energy consumption,” Winn said. 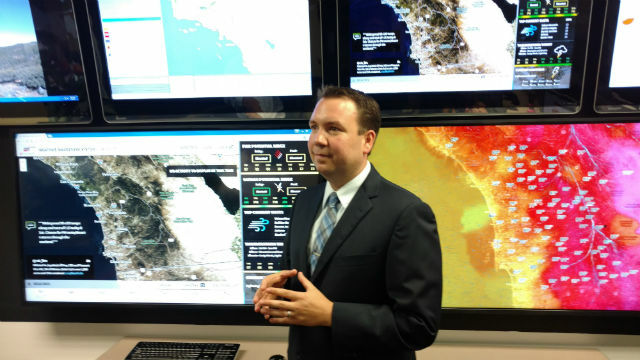 Brian D’Agostino, the utility’s meteorologist, said temperatures have largely stayed above normal since June 1 and SDG&E expects this pattern to continue through the summer. “The official forecasts coming from the climate center are now calling for warmer than normal temperatures,” he noted. D’Agostino and his team monitor 170 weather stations across the county to say ahead of changes in the weather. Winn said San Diego customers are currently using a maximum of 3,700 megawatts, well below the record of 4,800 megawatts set in September 2014. She said technological improvements like LED lights, energy-efficient appliances and programmable thermostats are helping lower energy use. The utility is currently offering a $75 rebate on thermostats available through its online marketplace.